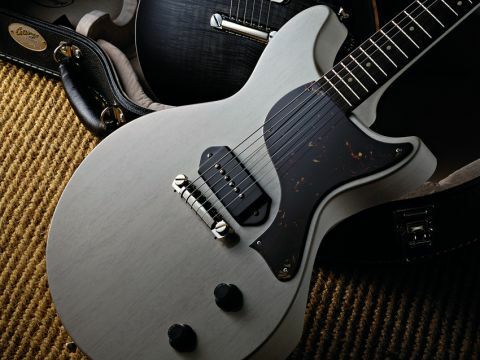 A perfect modern-day interpretation of the most iconic rock'n'roll guitar there is. The 290 DCS's design is about as simple as can be. The feel and weight here are both perfect. A lower-edge contour makes seated playing comfortable. The Collings' build quality far outstrips that of an original '57 Junior. "Whatever happened to original guitar design?" is a question many of us might ask while admitting that despite the merits of new Technocasters, frankly, we'd prefer a good ol' Tele, Strat or Les Paul. Bill Collings - one of the world's best guitar makers - has never chosen to be hugely original. Having built an unimpeachable reputation for acoustics, when the Austin- based company turned to electrics, Gibson provided the blueprint. "The 290 DCS reminds us how versatile a guitar like this can be, so long as you make use of the volume and tone controls." The 290 DCS swaps the original pre-1958 single-cut outline for the equally iconic post-'58 double-cut. Originally a 'student' guitar, this Collings version veers dangerously close to £3,000. How times change. So, it's not what any sane person would call cheap, but what exactly goes this guitar bring to the table? The Collings 290 DCS is about as simple as it gets: a flat- topped, all-mahogany, set-neck guitar with simple unbound, dot-inlaid rosewood 'board, a wrapover bridge with no individually adjustable string intonation, one single-coil pickup, volume and tone. So why is it so expensive? Well, Collings builds its electrics with as much care as it does its acoustics. Bodies and necks are weighed and matched. The CNC-assisted joinery not only ensures consistency, but the sort of perfection that's impossible by hand or the old school production methods. The weight and feel of the guitar is perfect. There's a belly cut on the bass-side back and another smaller cut on the treble side back, which helps it to sit perfectly balanced on your right thigh. The treble horn has more space than the original, aiding upper fret access and making it visually different. Edge radiusing is tight and the thin nitro-cellulose vintage white gloss finish is speckled with the grain of the mahogany underneath. It's contrasted by the tortie plastic scratchplate that mirrors the original. The neck joins the body at the final 22nd fret, but remove the scratchplate and you can see that not only is the tenon the full width of the neck, but it extends some 67mm into the body. The joint is gap-free and the heel small though slightly sharp-edged. In profile the neck is a deep 'C' - it feels big but not silly: 22mm deep at the first fret, filling out to just under 26mm at the 12th. The finely fitted, profiled and polished 2.6mm x 1.12mm frets sit on the 305mm cambered 'board, the edges of which are lightly rounded, while the scale is slightly longer than a Gibson original at 632mm (24.875- inch). The set-up (with 0.011s) is excellent, the bone nut perfectly cut and smoothed. The hardware seems just as simple - a set of Collings logo'd Gotoh tuners with proprietary grained ivoriod tuner buttons and what looks like a standard Gibson wrapover bridge. But the Collings wrapover is machined in-house from bell bronze, not cast, and the top ridge is subtly intonated - one reason why it's so expensive! Checked with a Peterson Strobe tuner, the intonation is scarily accurate - unlike an original's notoriously erratic intonation. Despite its single pickup, the 290 reminds us how versatile a guitar like this can be, so long as you make use of the volume and tone. The volume here has a slightly unsmooth taper - it leaps up a little at the end of its travel, but this works well in its favour. Knock it back slightly and you have your rhythm level, a quick flick upwards and you're in solo mode. The tone taper and its effect is superb. The P-90 is a single-coil and has a lot of high end, which can sound a little screechy at higher gains. Knock the tone down a little, however, and not only does it smooth out the sound but, rather like knocking back a wah pedal, focuses the mids. The litmus test of a Junior is always to knock back the volume to about half and clean up your sound - leave the tone wide open and you should have an almost acoustic-like voice. The 290 DCS does that pretty well - it's not quite as resonant as a real single-cut '57 Junior, nor does it have that design's additional low end, but it's close. For many, the definitive Junior tone is that fat overdriven Leslie West sound and it achieves that saturation with life and sparkle. Add in an outboard gain boost, use your volume and tone, and you have a monster rock 'n' roll guitar. But switch amps, clean up the sound, reduce the volume and take the tone way down and you have a surprisingly usable jazzier, darker tone; pull the tone back up and there's more than enough clarity for country twang, pull the volume up and you're into Texas sizzle. The P-90 isn't quite as hot as our original Junior, and the guitar is a bit less acoustically resonant, but in all other respects - build, intonation, tuning stability, neck shape, feel and set-up - it's far superior. Once you've played a great guitar it's hard to go back, and that's the issue here. We know we don't actually need guitars that are as great as this instruments to make great music, but that doesn't stop us dreaming. Why wouldn't you want the best? Yet as financial times are getting tougher for the vast majority of us, you have to ask what place guitars in this price bracket hold in the real world? They will certainly hold their value compared to a more everyday instrument, but condition remains everything should you want to sell. With the Collings, we'd just want to throw it in the van and play the hell out of it: goodbye resale value.